Will Frontier Communications Corporation Raise Its Dividend in 2017? The telecom already has a huge dividend yield. Can investors expect even more? The telecom industry is notorious for having high dividend yields, and Frontier Communications (NASDAQ:FTR) has stood out for a long time in delivering big payouts to its shareholders. Yet that doesn't mean Frontier's dividend history has been positive. Massive dividend cuts reflected the deterioration in its business in the early 2010s, and since then, Frontier has had to work hard to try to turn big acquisitions from major telecom carriers into sustainable profit growth. Let's look more closely to see whether Frontier Communications Corporation is likely to raise its dividend in 2017. Data source: Yahoo! Finance. Last increase refers to ex-dividend date. N/M = not meaningful; Frontier had negative earnings over the past 12 months. Frontier has had a turbulent dividend history over the course of its existence. In the 1970s and 1980s, Frontier -- which at the time was known as Citizens Communications, steadily boosted its dividend on an annual basis. Yet in 1990, the company gave up on cash dividends entirely, instead doing stock dividends for most of the rest of the decade. Then, starting in 1998, the company didn't make any dividend payments at all for six years. That pause came to an end in 2004, when Frontier announced a $2 per share special dividend and reinstated its quarterly payouts. The telecom company instituted a $0.25 per share regular dividend, which it sustained even through challenges like the financial crisis in 2008. Yet in the 2010s, Frontier's dividend success again hit a roadblock. In order to grow, Frontier decided that it needed to make major acquisitions of assets from other telecom companies. That strategy required capital, so when the opportunity arose to make a massive purchase from Verizon Communications (NYSE:VZ) in 2010, Frontier responded by cutting its quarterly dividend by 25%. Even with the cash freed up from the lower dividend, Frontier still had to incur substantial debt in order to do acquisitions. The telecom therefore made a further move in 2012 to conserve capital, cutting its dividend again, this time by nearly half, with the goal of investing in its network assets and integrating the acquisitions it had made in recent years. Since then, investors have seen a glimmer of hope in the form of a 5% dividend increase in early 2015. At the time, Frontier was celebrating the early success of its newly acquired operations, and it believed that greater free cash flow could sustain larger payouts indefinitely into the future. Last year, though, Frontier made another major acquisition from Verizon, this time acquiring key assets in California, Florida, and Texas. The deal stretched Frontier's financial capacity, again raising questions in many investors' minds about whether a further cut might be necessary going forward. Moreover, from an operational standpoint, the acquisition hasn't gone as well as investors had hoped, and that could produce less growth than Frontier initially expected. Will Frontier raise its dividend in 2017? The key to what Frontier will do with its dividend this year is what financial results it sees from its newest asset purchase. If it can take full advantage of high-value customers in the three huge markets that were part of the Verizon deal, then the resulting cash flow could well allow Frontier both to pay down debt and to boost dividends. If profits don't live up to Frontier's hopes, then the dividend will stay flat or fall in 2017. Frontier Communications' experience with its dividend shows some of the risks involved with high-yield dividend stocks. 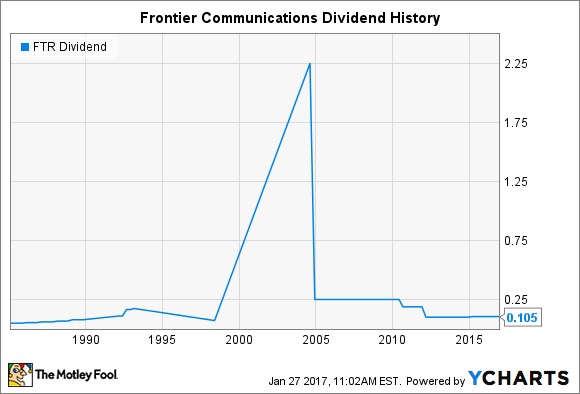 Frontier might very well come through with a dividend increase in 2017, but it will take a much more successful effort in maximizing the value of its customer base than the telecom company has managed to make in past years.